Troubleshoot from a remote location (office, plant floor, or another location)—anytime—day or night, 24/7. No need to climb up on the crane to diagnose and reset a fault. 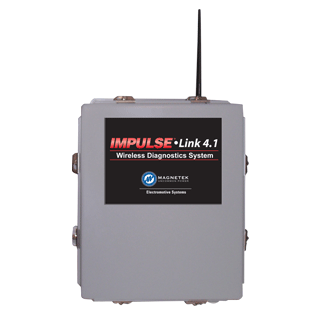 IMPULSE•Link 4.1 WDS can also be used on your facility’s OmniPulse DDC Drives. A WDS upgrade requires only a short installation time. It can be customized to a specific drive and monitors the parameters and provide diagnostic information unique to that drive’s application. 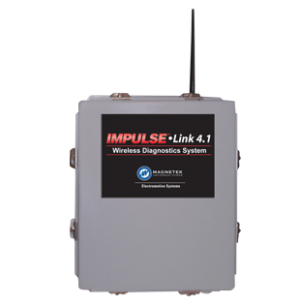 Existing OmniPulse DDC drives can be easily retrofitted; so few infrastructure updates are needed and no additional training is required for operators and maintenance crews. It uses the same interface as most current hard-wired diagnostic devices. The WDS alerts you of a problem and transmits this diagnostic data to be read by a technician. This allows maintenance workers to be prepared with the right tools and parts to fix the problem before getting up on the crane to do repairs. Valuable time and manpower is saved so the crane gets back on-line efficiently. The WDS is a digital device with no moving parts, so it consistently monitors the drives without breaks in transmission, providing increased safety, security and reliability. Whether you have a single crane or multiple cranes in difficult to access locations, WDS allows you to easily monitor and diagnose your OmniPulse drives wirelessly. *Customers will need to install the latest WIBUKey driver from WIBU.com for 64-bit operating systems.